A plethora of printable worksheets had been drafted specifically for students of Grade 2 and above to improve their skills in 2-digit subtraction with no regrouping / borrowing. The worksheet design includes both vertical and horizontal formats. Six worksheets under each subtopic contain a range of 15 to 100 problems per page. Bolster your child's 2-digit subtraction skills with this set of drills in different formats that comprise 15 problems per page. Use the answer keys to help them check their solutions. Employ this assortment of drill worksheets that contain 25 problems per page that provides for abundant practice. Click on the 'Download the set' option to download all the PDF files under this topic. 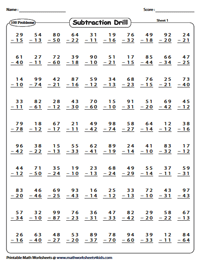 Give young learners an extra dose of no regrouping subtraction drills with this set of worksheets that comprise 50 problems per worksheet. Help them set a benchmark by recording the time taken to complete a worksheet! 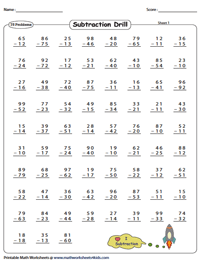 Time is the essence in completing these worksheets that feature 75 problems per page! 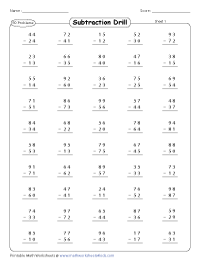 This mix of worksheets is highly recommended to further refine a student's skill at two-digit subtraction. 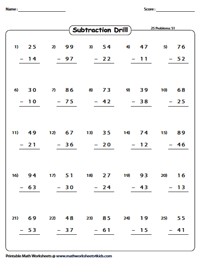 Satisfy your child's craving for subtraction with this series of no borrowing worksheets that contain 100 problems per page! Use the download option and get access to all our worksheets under this section.